You might be interested to know that curry is not a spice. In fact, there are several definitions out there designed to describe curry’s various combinations of piquant flavors, with many of these relying on origin just as much as how it’s used in the kitchen. The important thing to remember is that it’s a blend of spices that can be selected and mixed by hand or purchased as curry powder to get the exact level of heat, spice or mellow warmth you’re looking for. In my quest for the perfectly mild, yet also spicy curry, I began working on my own concoction. My yellow curry can be altered to suit a spicy palette or toned down for those who prefer a mild heat, either way it’s depth of flavor and fragrant bouquet of spices will have you craving Indian more often. I prefer a rich, velvety sauce with lots of meat and vegetables that offers up a variety of textures and flavors. 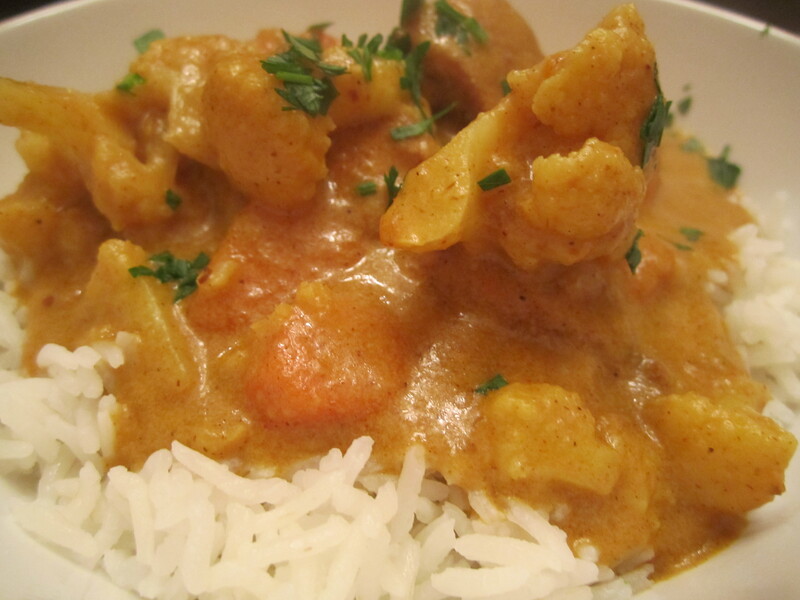 I use big chunks of carrots and cauliflower that soften as they simmer and absorb all the flavors of the cooked spices. The rich flavor and velvety quality of the curry is perfectly paired with freshly steamed jasmine rice; you can’t help but go back for seconds. Just adjust the amount of cumin and red pepper flakes to change the level of heat, either way you’ll get a traditional Indian curry worthy of being part of your menu. Once the vegetables cook down, add tomato paste, coconut milk, and carrots. Stir in new ingredients, cover and bring to a simmer on low heat. Leave for 20 minutes to let all the flavors meld. While the curry flavors develop, it’s time to make the raita. Add chicken and cauliflower continue to simmer for another 20-30 mins. Serve over rice with a side of Puppodums and raita. 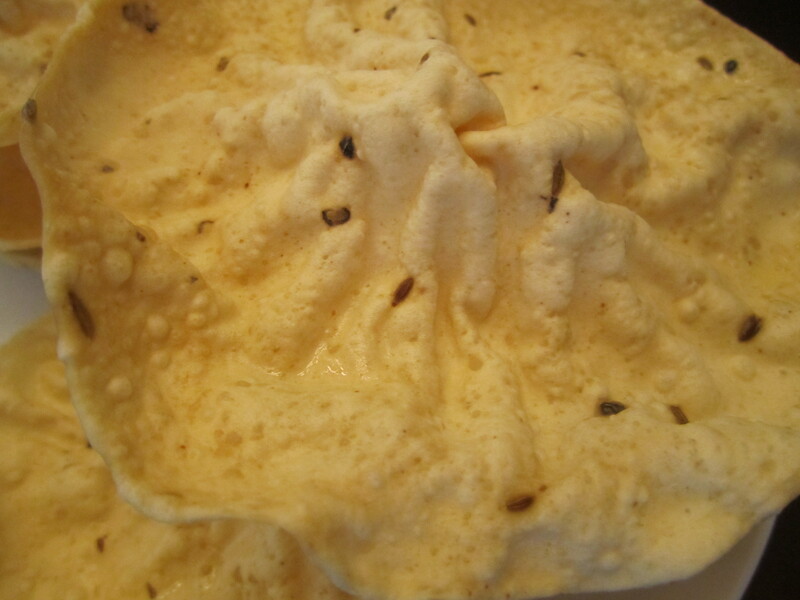 Puppodums are wafer thin Indian “crackers” made with lentil flour and sometimes spices usually served at the beginning of a meal, or alongside the main dish with chutney and raita for dipping. I LOVE THEM! I usually eat a whole box when I make curry, I break them up and use them like a spoons. I just can’t have curry without them, and the ones from the store are easier than making them from scratch. I buy the Tiger brand Spicy Puppodums, spray a little oil on them, and them pop them in the microwave for 40 seconds. Puppodum perfection!